Home / Brooklyn / Brooklyn GOP / Brooklyn GOP Radio / Concerned Veterans for America / CV4A / CV4A Accountability Project / Gene Berardelli / Jessie Jane Duff / Lt. Col. Steve Russell / People's Republic of New York / Russell Gallo / Veterans / CPAC 2014 - Concerned Veterans For America! 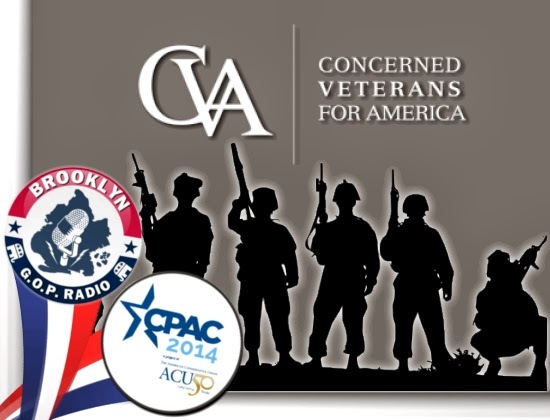 CPAC 2014 - Concerned Veterans For America! Here's a first for Brooklyn GOP Radio's CPAC coverage - We're hosting an organization! We are so proud to bring our audience selected interviews with guests from Concerned Veterans For America. It's no secret that we here at Brooklyn GOP Radio support those men and women who are serving and have served at home and abroad in our nation's Armed Services. So when we hooked up with CV4A, we've not only gotten primo interviews with "Gunny" Jessie Jane Duff and Lt. Col. Steve Russell, but we've developed a relationship and a platform for bringing awareness to the challenges our veterans face everyday. Being the son of a veteran and having partnered with First Sergeant Gallo, I couldn't think of a better thing to do with this show. The Department of Veterans Affairs (VA) is failing America’s veterans. For too long, veterans of all generations — and their families — have been underserved, overburdened, and flat-out ignored by an unaccountable bureaucracy. Veterans submit claims for battlefield injuries…and then wait for years. Veterans seek basic medical diagnosis…and then wait for weeks. And in the most tragic cases, veterans are given sub-standard care…and lose their lives in VA facilities. Families, along with their veterans, share the burden of these bureaucratic failures. The problem isn't so much lack of money as it is a combination of mismanagement and broken promises. We'll be sure to go into everything in great detail in our CPAC 2014 coverage, but for now, go sign up at CV4A's Accountability Project site and check out the video below.